Here's a cool thing: a new mod for Skyrim lets you wear armour and outfits as a full-blown disguise, allowing you swap sides and trick NPCs across the game world. 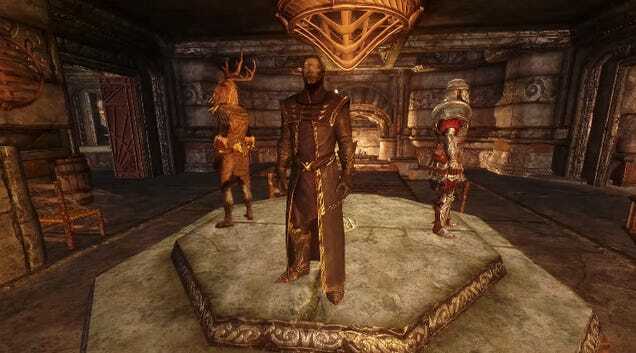 The mod is called Master of Disguise, and lets you "Suit up as a Dark Brotherhood assassin, a Madman of the Reach, or even a lowly necromancer and experience Tamriel as though their allies and enemies were yours". The outfits are cool, but that last effect is what makes it useful, as by changing your disguise you can affect how the rest of Skyrim's inhabitants treat you at the drop of a hat. Or, well, cloak. You can grab it here. I'll try it out soon, and if it works as well as it claims, I'll likely be adding it to THE LIST.